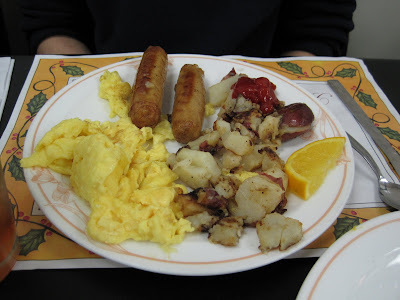 This morning, we went out to breakfast at Bob's Kennedy Diner. According to Munch, Bob of this diner is also the Bob from Bob's Diner that used to be on Noblestown Road. This aroused my interest -- back in my 20's when my friends and I used to stay out late we would often end the evening (start an early morning?) at Bob's Diner on Noblestown Road. 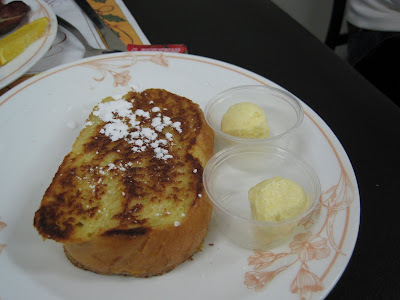 Plus, SP & I have been looking for a diner like this in our area. We tried Eggs N'at in Moon and enjoyed it but although it's only about a 15 minute drive, it seems far. Bob's is only 5 minutes from us. 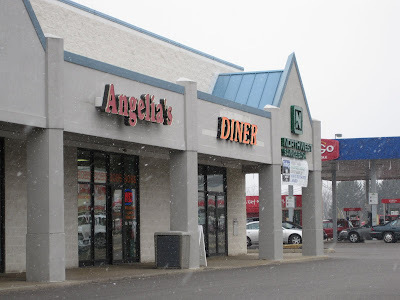 It's in the same strip mall area as Rockefeller's Grill and the Giant Eagle on McKees Rocks Road. Bob's sign is just an orange 'DINER' sign. When we arrived, we weren't sure if we should just take a seat or wait to be seated. We ended up taking a seat, but I think you are supposed to wait to be seated. Oops. There's not much to the decor, but this is a diner. You're not there for cutesy or trendy decor, you're there for some tasty breakfast fare. I ordered some decaf coffee to warm up and SP had iced tea. 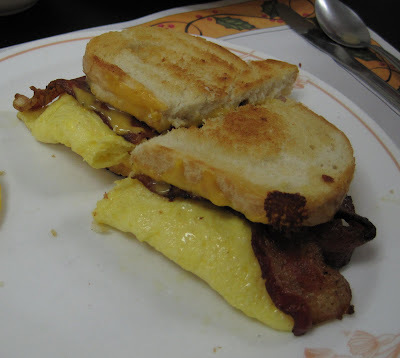 I decided on my usual diner breakfast: a breakfast sandwich. Bob's is on Mancini's Bread - yum!!! I chose bacon. SP ordered the Bountiful Breakfast and chose scrambled eggs and sausage. We split a piece of French Toast. The staff is friendly. Bob was there. He was going around saying hello to customers and helping clear tables. A very nice guy! We both enjoyed our breakfasts. My breakfast sandwich was not too greasy, which was nice. We'll definitely be back. It was a great way to fuel up before heading out in the snow flurries on errands, including trips to Sarris Candies and to the mall (thankfully the mall gods smiled on us and we found a parking space close to the entrance!). I found a very nice protective case for Elf. 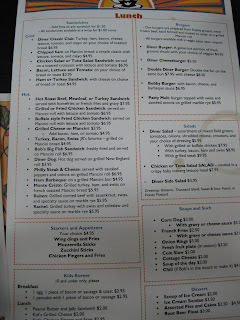 And yes, I was the one who dropped Elf on the table at Bob's when I was trying to take photos of the menu. Oops. The strap was around my wrist, but I wasn't holding Elf high enough when he slipped out of my hands and hit the table. He's a slippery little guy, even in my small hands. Last night was a quick dinner night. We had hoagies. 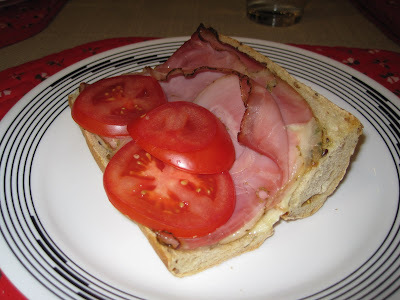 SP bought a multi-grain baguette: He also bought rosemary ham, provolone, and tomatoes. 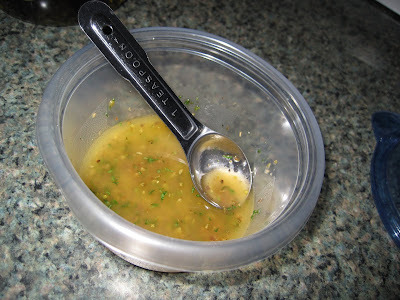 I whipped up a 'sauce' of olive oil and red wine vinegar with black pepper, oregano, and parsley. It was 2 tsp olive oil and 1 tsp red wine vinegar. 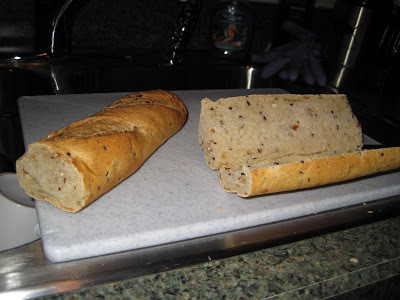 Delicious, crunchy hoagies. After hoagies, we watched Night At the Museum 2: Battle of the Smithsonian. It was OK. Not as good as the first Night At the Museum. Jared and I tried to go there on Friday evening (we were hoping it was one of those "extended hours" diners)! How funny! Glad it was a good experience. I was craving diner food. I have been to Bob's about 8 times now. His breakfasts are the best. I love the sausage and the bacon is nice and thick. Terrence makes the best omelets. Mary and the other waitress are all so nice and call you by name after you been in a few times. Lots of room, you don't feel crowded there at all. Bob is a nice man and we are always glad to see him on the job. His two kids work there sometimes and they are nice too. 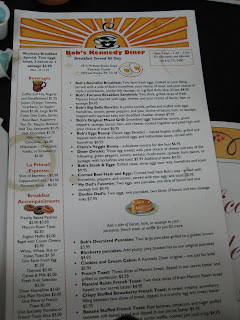 If you want a great breakfast in a great atmosphere, Bob's Diner is the place to go.